So I have put off reviewing Darksiders until the patch, sorry, 'Update' was released. “Why?” you ask. Well I wanted to give the game an honest chance to impress me. I know games that need updating so soon after release usually annoy the hell out of me, but I thought I should give it a chance. After-all, new year, new me. You play as War, one of the Four Horsemen of the Apocalypse. The role of these Four Horsemen,in the world of Darksiders, is that of a peace keeping force between Heaven and Hell. A peace keeping force put in place by The Charred Council. If the treaty (or Seal) between the two is broken, the Horsemen are sent to stop the battle. At the start of the game your summoned to Earth as total war has broken out between Heaven and Hell causing the destruction of Humans. During one of your early battles, you discover that the Seal has not been broken and you are the only Horseman that has been summoned. So you now get reprimanded for your involvement in the battle and have all your shiny powers taken away by the Charred council. War, being sentenced to death, requests that he has the opportunity to find out what caused the battle and restore balance, the council agrees but under the condition that he is bound to a keeper of the council, The Watcher (you may recognise the voice from Batman: Arkham Asylum). This Watcher, is with you always and will kill you if you stray from the mission. I won't go into anymore detail regarding the story line, but it has kept me interested. Which is asking a lot considering the most recent games releases have not been able to keep me playing. Most games seem to be lacking a gripping and immersive story these days, much to my annoyance. Obviously a game needs amazing graphics, intuitive control systems and comprehensive gameplay mechanics to be competitive today, but I really don't believe it can become a truly successful game without a good story. 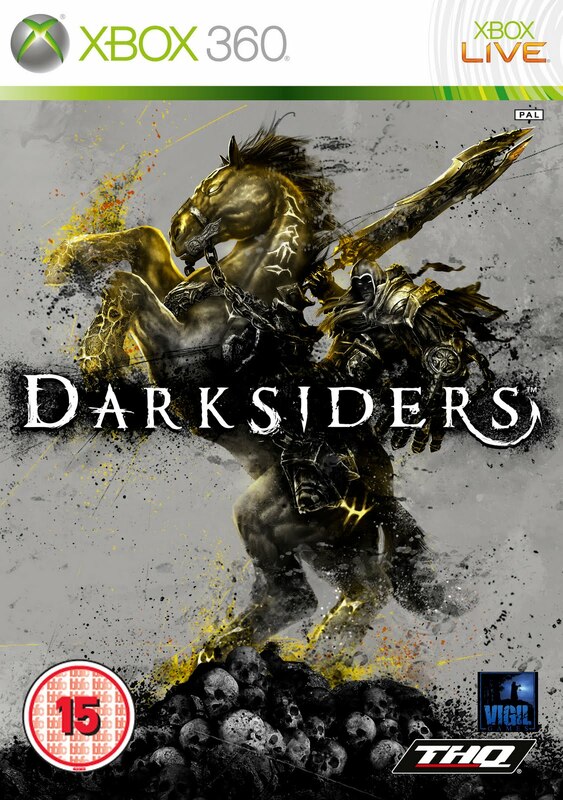 It needs heart, some emotive connection with the player and although Darksiders doesn't have that particular emotional connection, I believe it has the immersive story that is needed far more than any technical advancement made today. Plus, Good vs Evil on a Biblical scale, never gets old. War is never meant to be pretty, that seems to be the case here. The world created in Darksiders is by no means ugly or boring. The areas you travel are detailed and huge with very little loading. The criticism I have would be that the environments are slightly grey and drab. Yes its meant to be a post apocalyptic world, sparse and dead, but that's my only criticism with the look of the game. The character models are solid, looking good while attacking as well as dying. The level bosses look good too, with varying attacks to keep you occupied. War looks like he has been cloned from Marcus Fenix, Hellboy and Altair, a hooded brute with a big left fist. War's, armour is detailed and his weapons are functional well detailed. Particularly the Crossblade, this boomerang style weapon can hit multiple enemies at once and is useful in many of the various puzzles in Darksiders. The overall design seems to have a touch of cell shading to the colour scheme, which gives it a look of an animated movie in my opinion. This is not a bad thing as it gives the game another unique selling point, something to make the game stand out in a genre of similar looking and playing hack n slash games (see GOW I,II,III/Dante's Inferno). I've been humbled and surprised by this game. I was under the immediate impression that Darksiders was going to be a repetitive 'hack n slash' bane of my life. I am happy to admit I was completely wrong. This is no common 'hack n slash'. There are FPS elements, amazing platforming areas and some quality combat. Something that Darksiders has implemented which stands out is the camera use. Instead of having a static camera like most 'hack n slash' games, Vigil have decided to give the player full control of the 3rd person camera. No more side-on or 'room corner' combat. Constantly following the player, it shows off the size and magnitude of the environments and enemies you come across. The best part of the camera system comes in the form of projectile weapons. A simple click of the right analogue stick and the camera zooms in and brings up a targeting reticule. This allows for accuracy when throwing items required for certain puzzles or targeting distant enemies. Having multiple weapons assigned to individual buttons also makes for some impressive combos, using the Y,X and RT buttons. As with all 'hack n slash' titles, there is a lot of levelling up and purchasing of upgrades, which isn't too much of an issue. I would have personally liked to have seen a different mechanic involved rather than the standard soul gathering and chest opening that's seen in similar titles. The level design is pretty sound. Autosave checkpoints are in pretty decent places, frustrating as it is when you die after a long difficult battle, having the autosave in better positions helps a players game-rage a hell of a lot. The biggest problem I encountered, in regards to gameplay, had to be how little help you get navigating the world you inhabit. For example, one level had an exit you can't use until you kill everything and find something for the 'gate keeper'. I looked high and low for this area, walking around the level for over an hour. Then I realised, The Watcher. As you have The Watcher seemingly glued to your armour, pressing the back button will summon him and he will give you hints to your current objective. Let me clarify: THE CURRENT MISSION. No, not the tasks that lead up to the mission objective, its just 'You need to conquer (insert generic level boss here)' and not 'we need to find this artefact before we can move on, its over in that direction...'. Why oh why! This could have been the games saving grace, especially when you have no idea where to go. I finally found the solution to my dilemma via an online hints site. Yes I know shameful, but even with the hint at my disposal, I still had difficulty finding the tomb that I had to drag away from a dungeon opening. No highlighted cursor or anything really, just a small silver sparkle on a grey tomb. How am I meant to see that? Make it red, gold or even purple but not silver on grey come on guys! I don't want to be handheld through a game, but a little signposting wouldn't hurt. Overall its a tidily developed title, a little improvement on the level navigation/objective locations would definitely have prevented dome much unneeded frustration. Its a big thumbs up from me. Playing Darksiders, I feel a little bit more joy than with the usual hack 'n' slash action adventure games like God Of War et al. I find these games very repetitive and unimaginative, but so far I'm enjoying Darksiders. Its impressed me far greater than I expected and I would recommend this to anyone as there is definitely something for everyone to enjoy in Darksiders.